The top of Albert Road, that gradually becomes Highland Road, is quieter than it’s other end. Not many people venture this way much and keep to the comfort of the King’s Theatre and the One-Eyed dog. Well, that’s unless you’re a regular at the Festing but let’s face it, you’re only going there for one reason. But since September last year, there has been a great reason to venture this far East. 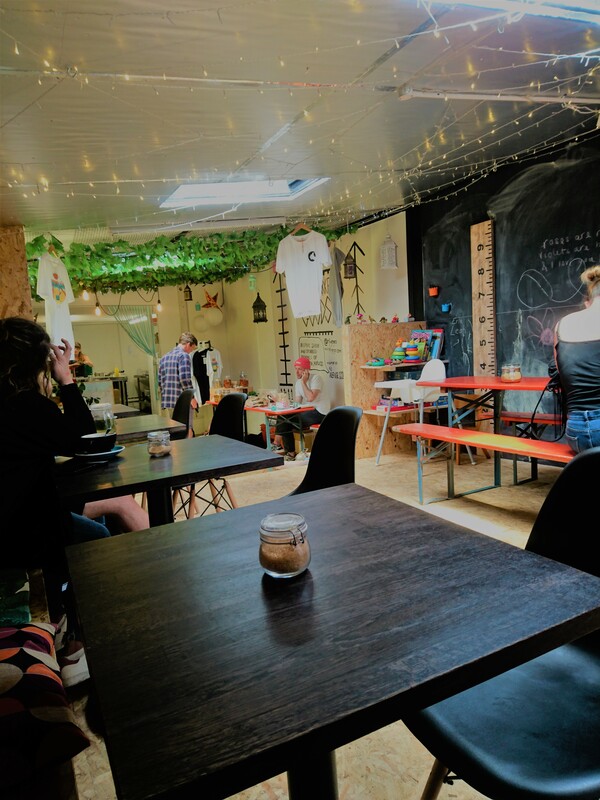 Opened by Brian and Dani, Hunter Gatherer is a unique treat that has made quite an impressive mark on Southsea, especially the alternative coffee and vegan scene. It’s very different. There are chipboard pews to sit on as well as long, orange benches and decorations that keep true to its name. There are fake leaves hanging from the ceiling downstairs, tree patterned cushions and fairy lights that, in the evening, give the place a warm and atmospheric glow. 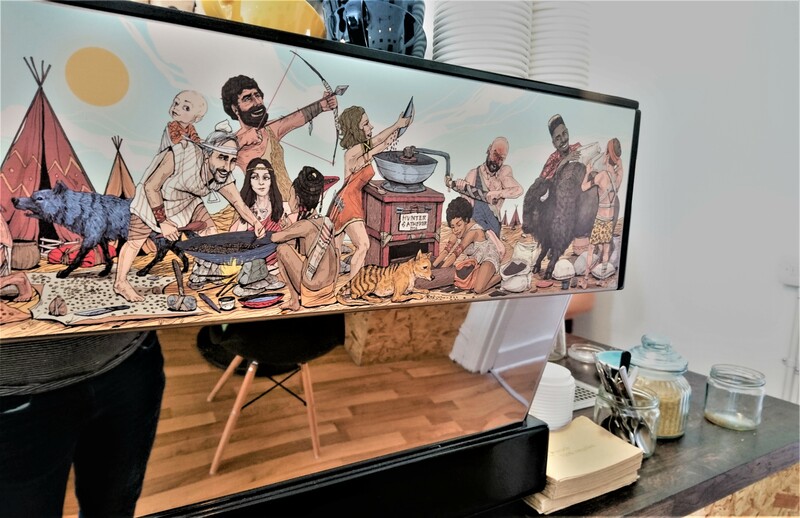 At the front they sell greeting cards, teas and badges and across the till is a cool strip of artwork by Sako-Asko, featuring the members of staff in the role of our primitive ancestors. It oozes character and as the smiling staff welcome you and you scan over the menu and specials board, you can see why this place is one of a kind in Portsmouth. 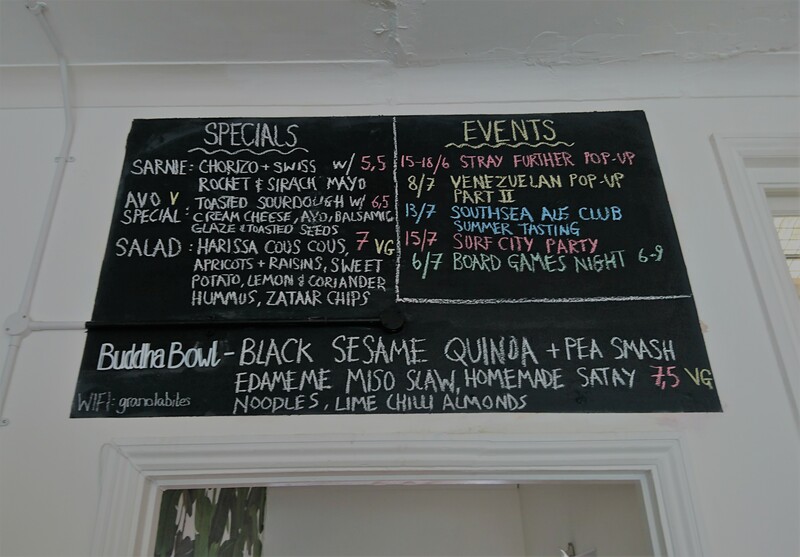 The menu, although small, features great brunch themed meals, all bursting with a range of ingredients which are friendly for vegetarians and vegans. Some options include a safe avocado on toast, home granola, detox salad or, the growing in popularity, Buddha bowl, rich with beans and veg. The Buddha bowl of the day included noodles, quinoa, black beans and miso slaw. Staring over at some people who were currently enjoying, I was certainly tempted. They also have a small range of cakes to nibble on such as lime and chai drizzle and some protein power balls for anyone looking for a quick drop in. Hunter Gatherer sell specialist coffees from all across the globe like Ethiopia and they are always severing different flavours and specials so there is plenty to spice it up. 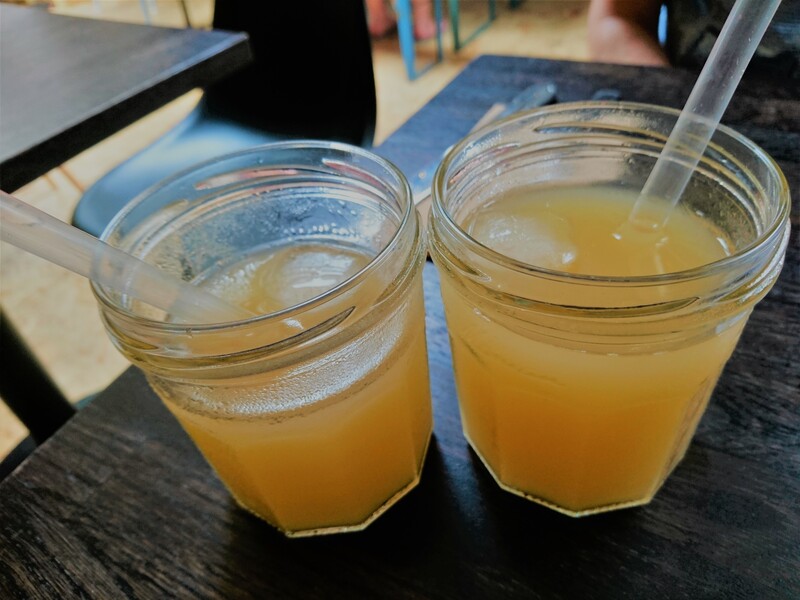 On a hot day like this one, I settled on one of their fruit juices, which they have plenty of, as well as brews from Southsea Brewing Co. I eyed up their Fentimans range such as the Dandelion and Burdock but settled on an apple juice to quench my summertime thirst. I ordered a brunch stack and a vegetarian sausage sandwich and took a seat downstairs. In front of me, a chalkboard covered one of the walls where people left messages and little drawings. I added my own little signature and then turned to the kitchen below me where a pop-up shop was taking place. You see, Hunter Gatherer is more than just a cafe. They put on countless events throughout the year from the Venezuelan Food pop-up to The People’s Louge which always thrive with colour, music and flavour. For their last event, the 10th June, people were queuing up outside! This time was the Black Market Goods charity pop-up with Moroccan fashion, decor, teas and spices for the aid of abandoned animals. I had a good nosey before my food arrived. I stroked the soft throws, smelt the meat and curry spices, bought a wicker bag and some mint tea and cuddled the beautiful greyhound Moose who was assisting purchases. The events on at Hunter Gatherer are not just inspired by the culture and life from around the globe but also from within the city. Every other month they have a poetry performance night courtesy of The Front Room. Check it out sometime, maybe perform at an open mic, gorge on some global street food, dance to some drums or even entertain yourself at their board game night. My drink arrived in a repurposed jam jar with a straw and lots of ice. One sip and ‘aaaaah perfect.’ My food then came and looked incredible. 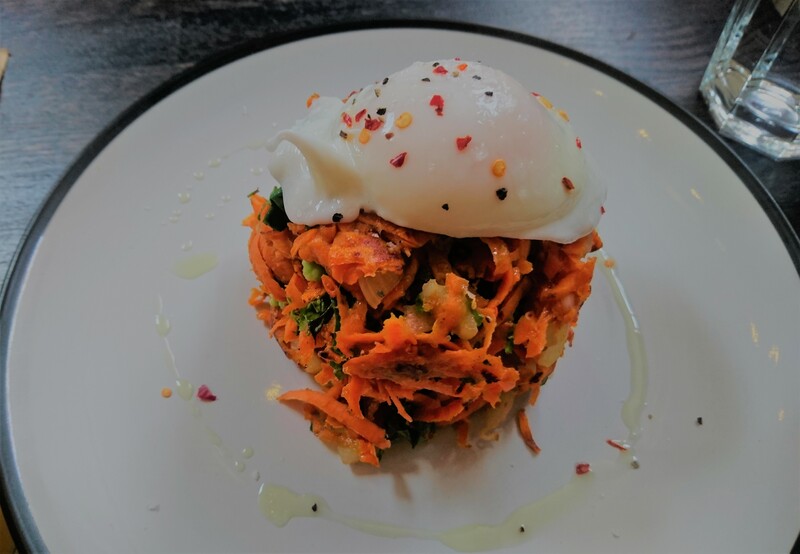 The brunch stack towered with 3 sweet potato and kale rostis with avocado and spinach in between. An egg glistened on top. Of course, if you are vegan you can easily substitute this. 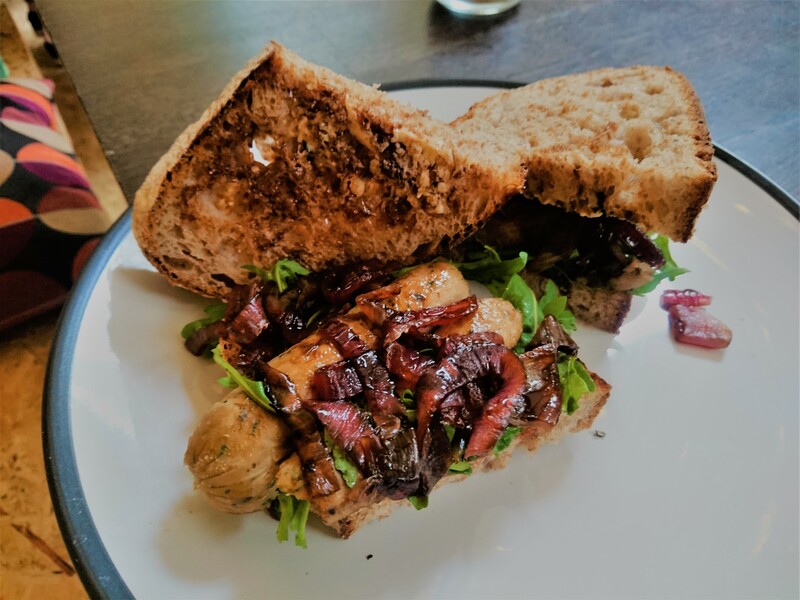 The sausage sandwich was made with thick wholemeal sourdough with a generous helping of sausages, rocket and caramelised red onion. I opened it up and my eyes bulged. To see so much packed into a sandwich for only £4.95 was awesome and really showed the extra mile Hunter Gatherer go. It all worked brilliantly together and you wouldn’t believe the sausages weren’t veggie ones. Hunter Gatherer is a special place which has earned a place in my heart and will definitely earn a place in yours. It is bursting with character and is one of the few food places that successfully cater to vegans and vegetarians. For tasty specialist food you would expect to pay a hefty sum but this menu is actually cheaper than most others. Whatever your reason to visit, whether it be for their food or events, just make sure you go.